Cold weather - is it dangerous for your health? Home / Health / Cold weather – is it dangerous for your health? The medical evidence is clear: winter severely affects the health of the heart and other organs. According to research, cardiac problems and strokes increase by 20% – 25% (at least) during the winter months. Excessive cold increases the blood pressure and it also exacerbates back problems and skin diseases. Excessive cold: what is happening in our bodies? When the temperature is around 0 degrees Celsius, then it causes vasoconstriction, in other words the contraction of blood vessels, in order to prevent excessive heat loss. It is an effective mechanism that protects those who are not suffering from other disorders, but can cause discomfort to those who are facing heart problems. Vasoconstriction results in the increase of blood pressure, but also to the reduced flow of blood throughout the body including the heart. So, if the blood vessels that provide blood to the heart display constriction because of the existence of arteriosclerotic plaque, then the further reduction of blood flow because of the cold, may put the heart at risk, due to inadequate oxygenation and feeding. 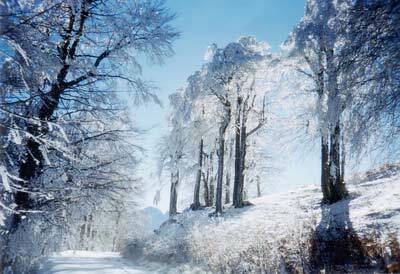 Cardiopaths should be careful with the extreme cold and avoid going to places with low temperatures and strong winds. It should be noted that strong air makes the cold even more noticeable. For example, when the temperature is at 5 degrees Celsius and the air is blowing at a speed of 30 kilometers per hour, the body feels the temperature 10 – 15 degrees lower. This is because the air evaporates the thin layer of water produced by the body when sweating, thus reducing the body temperature. In addition, the cold can aggravate asthma. The cool air irritates the respiratory tract by compressing the bronchial tubes and causing asthma attacks. Those who suffer from this disorder, on cold days should wear a scarf around their necks before they go out. Finally, low temperatures may intensify a headache, due to vasoconstriction, which in this case affects the blood vessels of the brain and irritates the nerve ends, causing more intense pain. Also, it is difficult for the vessels and the skin, while at the same time the seasonal viruses attack the respiratory system and can cause serious complications. In general, cardiovascular incidents increase during the winter months, with a maximum frequency in December and January. The arterial pressure is always higher during the winter months and lower in the summer (due to the consumption of liquids and sweating). The pressure increases with the cold, because of the spasm of the arteries, but also because of the greater quantity and quality of food. We tend to eat less vegetables and fruit in winter than in summer, and we consume more salt, while we are less active. Let us not forget that hypertension is responsible for 75% of heart failure incidents. The body, therefore, has more needs in winter and the heart works harder. In addition, the cold environment causes increase in heart beats, as our body – especially when we tremble- tries to maintain the body temperature stable. How can you protect your health from cold weather? During the winter months, the needs of the body regarding calories are increased, since the metabolism is accelerated. During this period, the nutritional habits usually differ in relation to summer, due to reduced fluid intake, but also because of the increased quantity and quality of food. Because of the reduction in temperature we tend to consume foods that are high in fat and salt. This is wrong! It is necessary to follow a balanced diet. The reduction of cholesterol and risk of cardiovascular diseases can only be achieved if you follow a balanced diet low in salt, saturated fats and cholesterol, with the desired content in omega-3 and omega-6 fatty acids (fish, walnuts). In addition, you need to have as much as possible more quality meals during the day (5 meals), with emphasis on fruit and vegetables. After lunch, you have to avoid exposure to cold. During the winter months, too much alcohol should be avoided, which leads to heat loss, a drop in body temperature and increased fluid loss from the body. The consumption, and much more the abuse of alcohol prior to exposure to cold, may cause large heat loss, with disastrous results for the heart and blood vessels. Therefore it is recommended to avoid the consumption of more than 1 – 2 glasses of wine, quantity that preserves its beneficial contribution against hypertension.